A favorite of traditional Christmas carols. 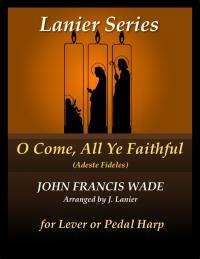 Although the carol (also known as Adeste Fideles) normally uses an accidental for the A major chord, this particular arrangement in the key of G Major is written so there are no lever or pedal changes required. The piece begins with bell-like tones and later uses descending scales in the right hand.